This day was packed full of activities. By now we were accustomed to living in Havana and ready to explore more that the city had to offer, including the vibrant art culture. 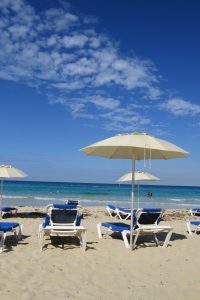 This day included trips to various famous art venues: the Museo de Bellas Artes, the Gran Teatro de la Habana Alicia Alonzo, as well as Club 1830, and then the beauty of the natural world: the beach. Museum of Fine Art, Havana. 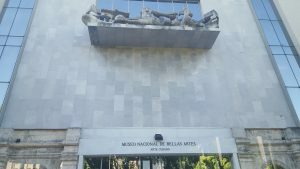 The first place we went was the Museo Nacional de Bellas Artes. This is the national museum of art located across from the Museum of the Revolution. 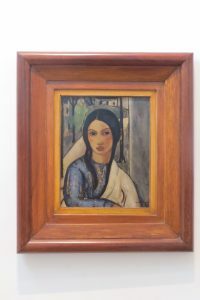 This museum featured Cuban art from every period of Cuban history. The art was much more beautiful than I anticipated. I found that while it had a certain European style, it also had a distinct Cuban approach. 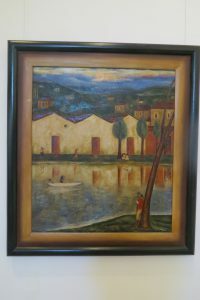 Some of my favorite works that I saw included: Servando Cabrera Moreno’s Milicias campesinas, Marcelo Pogolotti’s El intellectual o Joven intellectual, and Victor Manuel García’s Gitana tropical and Río San Juan. Many of these paintings created by Cuban artists was nothing like I have ever seen before. There were also many sculptures throughout the museum. I also really liked that one of the exhibits featured art created by Cuban kids. This exhibit was really cool because it focused on Cuban kids’ art while at the same time providing a history lesson to Cubans and tourists alike. 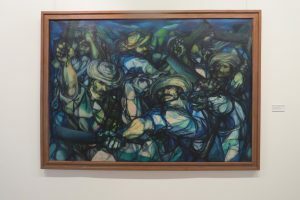 Servando Cabrera Moreno’s Milicias campesinas, 1961. 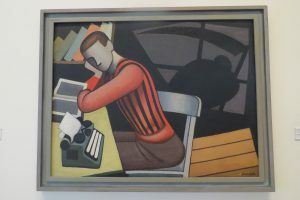 Marcelo Pogolotti’s El intellectual o Joven intellectual, 1937. Victor Manuel García’s Gitana tropical, 1929. Also known as the “Cuban Mona Lisa”. Victor Manuel García’s Río San Juan, 1943. Another interesting exhibit at the museum was the “El Hueco, un espacio del Arte contra la Injusticia” (A space for art against injustice). 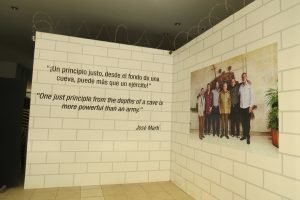 This space was created for every person to reflect on the punishment of solitary confinement of seventeen months imposed on the Cuban Five by the United States. This exhibit featured watercolor pieces done by the members of the Cuban Five. This installation was meant to give Cubans a firsthand account of the terrible experience endured by the Cuban Five. While we did not get to go in, as it was closed, this exhibit was sobering to experience nevertheless. It was impossible to imagine what life was like for the Cuban Five in solitary confinement, but instead of responding with violence, they responded with art and a warning for the future. Similar atrocities should never be repeated and this exhibit serves as a reminder to the public to never forget. After the art museum, we traveled about thirty minutes outside of Havana to a beautiful beach. The water was warm and a beautiful shade of turquoise blue. It was one of the most beautiful beaches that I have been to in my life. The beach offered me a chance to relax after a long week of going nonstop. After swimming for an hour or so, a few of us decided to take a walk down the beach. Along our walk, each of us collected pieces of sea glass and pretty shells that we found in the beach sands and among the seaweed. There is nothing better than enjoying a warm day on a tropical beach when everyone back home was experiencing winter weather. Blue skies and turquoise waters. After the beach, we went back to the Gran Teatro de la Habana Alicia Alonso. 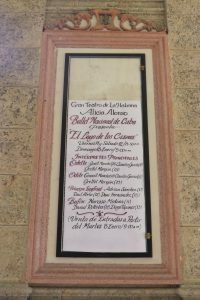 We had visited this the day before to see Swan Lake performed by the Cuban National Ballet. We were lucky enough to purchase seats in a box on the left side of the theater the day before. The costumes were spectacular, and equally magnificent was the backdrops created for the various settings of the ballet. The dancers were stunning, their footwork was impeccable and the entire performance I watched with awe as they danced through complicated footwork and graceful leaps. Before visiting Cuba, I did not realize there even was a national ballet company and did not realize that I would be lucky enough to witness a performance firsthand. It is an experience that I will never forget. Program posted outside the Opera House. 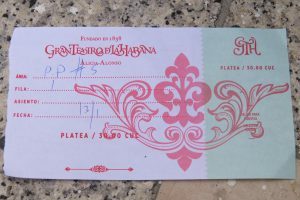 Ticket for Swan Lake Ballet. Inside the Opera House, before the first act began. 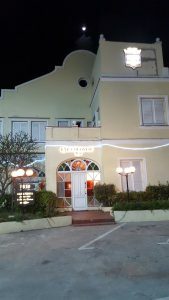 Even later that night, we went to Club 1830 in Havana. This club is known for outdoor salsa dancing by the water. It was a chance for us to interact with the locals and try out our salsa dancing skills with them. The club was full of energy and blasting Cuban music. The energy of this place was absolutely amazing. Everyone was dancing, laughing, and generally having a good time. Many of us stayed until the early hours of the morning. This day in Cuba was absolutely one of my favorites. We got to do so many exciting things and experience a vibrant Cuba filled with art and music and sun. The fine arts museum was more amazing than I though it would be. It was full of beautiful pieces of art created by painters that I never heard of before coming to Cuba. Swan Lake was one of the most beautiful performances, either ballet, play, or musical that I have ever seen. Everyone was sure to remember their few hours at the beach because most of us left with sunburns, in January. It was one of the most memorable days of the trip.